Nice location for Watford. Small green in front of the pub puts some nice distance between it and the road. Just GK IPA & London Pride on when I went in but it's a nice little pub, though it doesn't seem to do food, there was certainly none available when we went at lunchtime on Tuesday. Update! The Royal Oak has recently been taken over by new managemen so all the previous comments are no longer relevant. 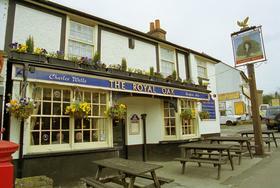 The Royal Oak to date is one of the nicest pubs in Bushey. Friendly atmosphere and providing great wines ales and lagers. Providing live entertainment weekly. The beer garden is simply beautiful with a new playing area for children and seating for the families. The pub provides good wholesome food as the Thai restaurent part is no longer. The pub also puts on festival events, check it out from the 16th -18th of October......big musical event and it's free for all. Nice seating at the front and all new seating internally. The present management have gone out of their way to make this pub a worth while place to visit. Traditional, friendly pub with real ales and Cask Marque accreditation. A few wooden tables out front and a beer garden at the rear. Restaurant area that specialises in Thai food I think. Was once a nice quiet booze & chat pub. Now sadly it has huge plasma screens and seems over-run with children and dogs and "Ingerland" attitude. The thai food was very good, however, the back of the pub is a very odd contrast to the front.